Flour Mayhem: Say hello to the family! These babies are pretty darn good. Yesterday Jason and I had some mini chocolate muffins, and it really put me in the mood to make some muffins myself. I had off today, so it was a good day to put my muffin makin' skills to the test! 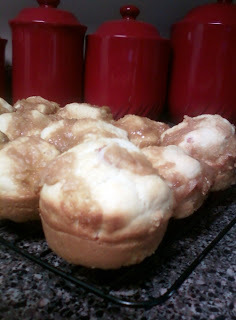 I started out with a basic muffin recipe, added a little bit of bacon.. Smelled really good, but before I popped them in the oven I wanted to add a little sweet. I really wanted to use some chocolate chips, but didn't have any. So a brown sugar crumb topping it was. 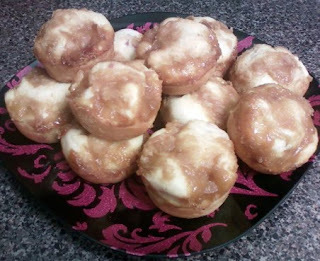 I overfilled the cups a bit, so I placed the muffin pan on a large baking sheet and that caught any jumpers. They came out looking scary, but using a fork I pulled them out and they went from an ugly duckling to a yummy looking muffin! After letting them cool on a wire rack for about 15 minutes, I couldn't help myself, I had one and it was really good. I'm super proud and I hope Jason likes them too! I sent him a picture of them and he said they looked good, so that's half the battle right there. Preheat oven to 400 degrees. Spray 12 cup muffin pan with cooking spray. Mix first 4 ingredients together well, stir in bacon. In seperate bowl mix eggs, oil, and milk. Make a well in center of dry ingredients and pour wet ingredients into it. Fold gently until mix is well combined and moist. In medium bowl, combine flour and brown sugar, mix to combine the two. Melt the butter, and slowly pour into flour/sugar mixture, stirring as you pour. Mix that thoroughly, and once well combined crumble over muffin batter. They taste great cold and warm.. So you decide how you want to eat them!!! I know I told you guys I would be making butterscotch chip cookies, well I'm not! haha I'm going to do a butterscotch cake with kahlua cream frosting. Oh yeah baby! Be on the look out for that bad mamma jamma!